By now it is excruciatingly obvious who is ready to do whatever it takes to pull off a big election win. It’s not the right. We are more interested in giving this one away. Instead, it’s the left. Democrats are determined to win at any cost. They get better at it year after year. After all, we taught them that the price doesn’t matter if it means getting what you want. In the process the people lose something very important: trust. Win at any cost means this? When all of our institutions are broken, unfair, unequal, or discriminatory, nothing is worth saving. That’s the message Obama taught the left. He also proved that we only need to follow laws we agree with and that extraordinary actions are good government despite Constitutional safeguards meant to prevent them. Democrats win at any cost on behalf of this? When Democrats wanted an immigration win the president found a way around the law and Congress. He issued an executive order. That worked, so we got more orders including an edict to pay minimum wage to salaried workers and a directive to schools on transgender bathroom use. The law enforcement debate means drug dealers being released from prison early and police threatened and killed after slanted media coverage of a very small number of officer-involved shootings. Leftist ultimatums on gun control mean downplaying the threat of radical Islam. We look the other way when people die in our inner cities because guns, not people are to blame for killing in the absence of a Democratic win on firearms regulations. Thanks to the left’s endorsement of Bernie Sanders the economic inequality debate brought us our closest brush yet with eat the rich socialism. With Sanders out of the picture someone has to take up the slack. Hillary Clinton has proved more than willing to lip sync for Bernie and Barack. Democrats will win at any cost in November. They want to keep the Obama momentum going. That means America loses something big: our trust in the integrity of the law, our Constitution, and political institutions. Is this loss worth it for the sake of flawed liberal principles and a candidate the Democratic Party should be ashamed to support? Deceptions, half-truths, and outright lies don’t matter to Democrats. A win at any cost is more important. Liberals picked a candidate with no credibility who reinvents the truth whenever she is found out. If anything, the left will undermine the people’s trust even more as Clinton follows in Obama’s footsteps and orders whatever Congress won’t approve. What will happen? Buildings won’t collapse. Nukes won’t go off. Our financial institutions won’t go under. Instead, our belief that our political system and way of life are fundamentally fair will be further eroded for the sake of a do whatever it takes agenda that rewards trickery and law breaking. Obama’s genius at skirting the legislature paid off. The worst thing about his quasi-legal accomplishments is that they changed our trust in the integrity of American government. Sure, politicians are self-serving and corrupt and the government wastes billions. Most of us still believe we have the best system of government in the world. Democrats want to change all that. Public support for Sanders and Clinton shows they are winning. Whether the win is police officers in danger, illegals amnestied by presidential order, a rogue IRS going after conservatives, or a bad nuke deal with Iran, Democratic wins no matter the cost have just kept coming. How bad will it get after Hillary takes over? Obama’s successes paved the way for her to steamroll over a Congress that will be more concerned with holding Clinton accountable for her past than keeping an eye on whatever marching orders she gets from special interests. That’s assuming Republicans hold the House. They might be so successful at undermining their own party that we lose the legislature, too. When we embrace a candidate we know is not trustworthy we feed the same rot that tells fringe elements in our society that it is all right to kill police officers and ignore the law if it gets you what you want. That’s damaging to America. It takes away something very important: the trust of the people. 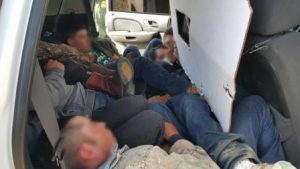 Photo: “Border Patrol Agents Halt Human Smuggling Operation in a Cloned Border Patrol Vehicle.” U.S. Customs and Border Protection. December 11, 2015. https://www.cbp.gov/newsroom/local-media-release/2015-12-11-000000/border-patrol-agents-halt-human-smuggling-operation, retrieved August 10, 2016.